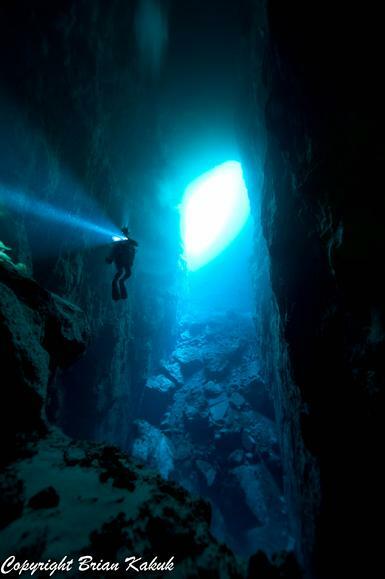 Dive the most beautiful underwater caves in the world with explorer Brian Kakuk. Brian provides exclusive one and two diver experiences in the most unbelievably decorated underwater caves on earth. The Crystal Caves of Abaco are unlike any other caves on earth. Imagine yourself gliding past massive crystal columns 30 feet (10M) tall and rooms so full of crystal formations that it can only be described as swimming through a crystal chandelier. Due to the fragile nature of these sites, the local dive operators have agreed that all cave diving on Abaco is guide only, and I only 1 to 2 divers (plus the guide) are allowed in the caves at one time. The Bahamas Underground does not guide large groups and our facility is set up for more of an exclusive 1 and 2 diver experience with a guide. There are currently no other guides for the caves here, but there are several open water dive shops that support reef diving as an alternative (please see our LINKS page). 1 diver, 1 dive per day (half day): $280 U.S.
1 diver, 2 dives per day (full day): $392 per person for the day. 2 divers, 1 OR 2 dives per day: $280 per person for the day. Note: CCR dives over 90 minutes or stage dives over 90 minutes are all billed at the full day rate and only one of these types of dives is done per day. Price includes pick up and drop off at your hotel each day, transportation to and from the dive sites, guided dive(s), cooler with ice and bottled water, equipment storage (wet or dry) for the duration of your diving with me. Price does not include cylinder or other equipment rentals, nitrox or oxygen fills, fuel surcharge. For locating flights, please use airport code MHH for Marsh Harbor, Abaco Island, Bahamas where my facility is located. There are daily flights from Miami, Fort Lauderdale, West Palm Beach. Please check with each airline concerning luggage limits as they do change during high tourist seasons and can be very limited at times. For details on dive depths, profiles, suggested equipment and bookings, please click HERE. A 50% deposit of the proposed guided diving days is required in order to lock in trip dates. Once Once the deposit is recieved, your dates are locked in and no other clients will be scheduled during your stay. You will have the caves and the guide to yourselves. The balance of the guided diving fees will be due 60 days prior to your trip. All other items such as tank rentals, oxygen use and fuel surcharge will be billed at the end of your trip and payable via Paypal in US funds, cash or by check in US funds drawn on a US bank. There are plenty of automated bank tellers (ATMs) located through-out Marsh Harbor that provide Bahamian dollars (1 US dollar is equal to 1 Bahamian dollar here). Please note: For guide health and fire reasons, we do not allow smoking around our guides, facilities, vehicles or dive sites. Here are a hotel reference document that may help you find suitable accommodations and the Bahamas Underground rental equipment price list. 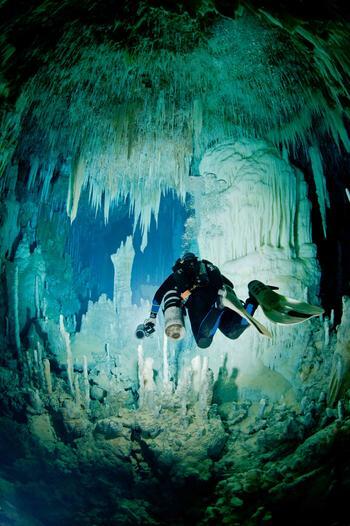 Although we have about a weeks worth of amazing back mount style of cave diving to do on Abaco, Side Mount divers will see much more cave and also see crystal formations that are found no where else on earth. 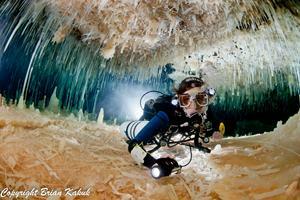 Consider adding professional digital images of your cave diving vacation by using our photographic services. Find out more on our Underground Photo Services page. 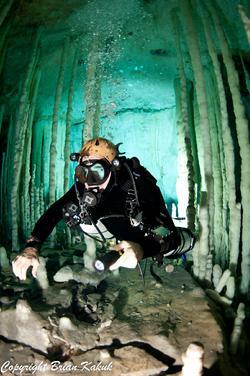 If you are interested in a cave diving trip unlike any other, contact us at bahamacave@aol.com or call at (242) 359-6128. Brian looks forward to the opportunity of showing you and your dive buddy the amazing crystal caves here on Abaco. In the relatively cooler months of winter here in the Bahamas, Brian runs several exclusive 5 to 7 day trips to the deep blue holes of southern Andros Island. This area possesses some of the most beautiful and technically challenging underwater caves in the world. Many of these sites have been explored by famed explorers George Benjamin (the original explorer of many of the off shore blue holes), Sheck Exley, Tom Mount, Rob Palmer and other legends of cave diving. We meet in Nassau, Bahamas for the 15 minute flight to the Congo Town Airport (MYAK) near South Bight area of South Andros Island. There we will begin diving the famous south bight fracture system which includes the famous inland caves Stargate Blue Hole, El Dorado Blue Hole, and Rat Bat Lake. The world famous Stargate Blue Hole in the Bluffs area of South Andros. This cave is massive inland fracture blue hole (see picture left) with beautiful formations, massive passages and depths of more than 330 feet in some areas (this cave can also be dived easily without going below 120 feet though). We will be staying at the comfortable Coral Beach Inn where owner Troy Kemp and his staff cook us fantastic Bahamian breakfast and dinners, while we take our lunch out in the field with us each day. We take a minivan to the dive site where local land owners will assist us in lower our equipment 15 feet down (and then back up!) to the water of Stargate. Off shore we will be diving SB (South Bight) 1 through 5, including Benjamin's Blue Hole or Exley's Boiling Hole. The strong currents in the bight and in the off shore blue holes will require that we time the tides to allow the best visibility and safe conditions. This means doing longer dives every 12 hours on the tides (except for inland dives). orh”, a massive 50 to 60 foot wide and nearly 200 foot tall inland fracture with air clear water and an amazing view. This is a long hike, our local land owner helps us carry the equipment to this remote, but most stunning cavern in the Bahamas. If you are interested please contact Brian Kakuk at bahamacave@aol.com or (242) 359-6128. The Entrance to Morhdorh, a massive cavern on South Andros Island.